When Professors Melvin L. and Margaret H. DeFleur of Boston University asked their foreign graduate students to conduct surveys of more than 1,300 teenagers in their 12 home countries, they expected to find distorted views of Americans. But the results even shocked them. Teenagers around the world believe Americans are extremely violent and criminally inclined, and they believe American women are sexually immoral. 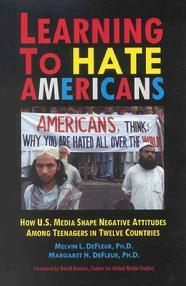 The DeFleurs place most of the blame for these negative attitudes on U.S. mass media, especially Hollywood. The DeFleurs warn that unless something is done to correct the problem, future generations of foreign teenagers will grow up "learning to hate Americans."